PM 2.5 is often associated as the biggest threat to the human body when Air Pollution is accounted for. The following video by UNICEF Magnolia shows what Air Pollution does to Children’s Body and Brain. The entire process of Particulate Matter entering our bodies is difficult to understand for a person who is new to understanding pollution. Since the PM 2.5 particles are 25 times smaller than the width of a human hair, it because incredibly difficult to stop its motion. However, the video brilliantly illustrates how Particulate Matter 2.5 moves into the body when we inhale air through our nose or/and mouth. It further shows how these tiny particles diffuse through the walls of the alveoli into the bloodstream. This is the part that circulates the air to the different parts of the body. Since these particles are not supposed to be a part of the bloodstream, they can hence affect the normal functioning of various organs in the body. These tiny particles can affect the working of lungs, immune system, heart and also the developing part of the brain. Since the brain keeps developing through various stages of life. A child’s brain, which is most active and in the developing stage in the earlier adolescence can be deeply distraught because of the presence of PM 2.5 particles. A child’s attention span, memory, and emotional dependency can thus be disturbed because of the increase of such particles in and around their livelihood. Social interaction – Which decides how a child will perceive the people around him/her can also be triggered because of the particulate pollution. It will only lead to the child getting introverted when social interaction is perceived in his area of interest. Since these particles can damage brain cells it can also lead to impaired cognitive development. The ability to learn is also disrupted which can later cause a degrade in the lifespan. Other than showing what Air Pollution does to Children’s Body and Brain, it also signals the various diseases that can be caused once these particles enter a child’s body in the earlier stages of life. 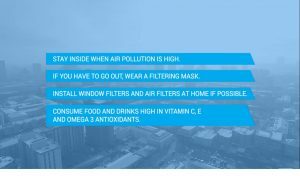 The conclusion provides the necessity for monitoring Air Pollution so that parents can help their children when Air Pollution is high. It doesn’t provide a concrete solution but does provide certain points that can help avoid these problems that can affect a child’s brain and body.